Published initially in 2010, this is one of the articles that was lost during our forum migration this year. We are trying to develop a community where photographers can come and discuss nature, wildlife and pet photography related matters. We encourage you to enter the forums to discuss this article as well as to share your own photographs and experiences in our forums here at NWP. My wife and I celebrated our Anniversary this Memorial Day weekend by driving up to Maine with the Dogess and camped for the week. One of the luxuries that we had scheduled for the trip was arranging to be on the first boat out to Machias Seal Island. 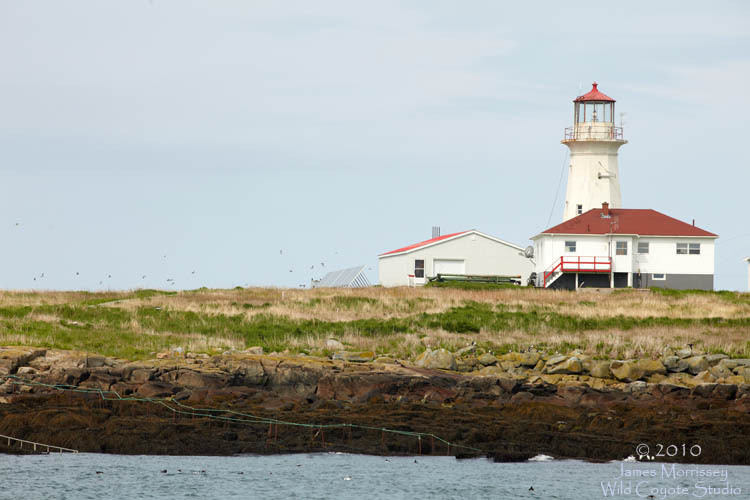 Machias Seal Island is a small, relatively barren island in the Gulf of Maine that is the home to several types of birds. In the very short time that we were there, we saw the Atlantic Puffin, the Razor Bill and a few others that I could not identify. The Puffin was the reason why we were going. For those not familiar with Atlantic Puffin, they are a beautiful, almost cartoon-looking like bird that in my opinion looks like a cross between a penguin and a parrot. They have amazingly rich, saturated beaks (which I am told fade during the non-mating periods). 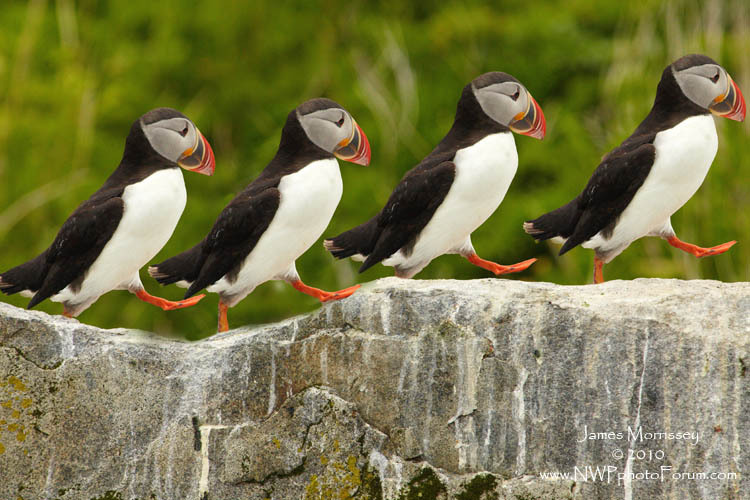 Puffins form breeding colonies each Spring and Summer along the Atlantic Seaboard. 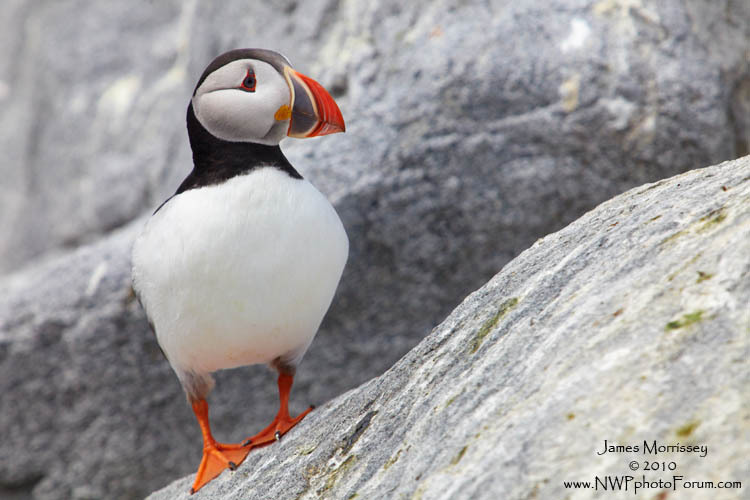 Having lived in New England for most of my life, prior to moving to New York, I had never seen a puffin in the flesh. This was going to be the year. We chose our tour guides (Norton's of Jonesport) based upon the recommendation of a friend of ours who told us that he had used them in the past and said they were very good. There is another company based out of Cutler that also has landing rights to go to Machias Seal Island. 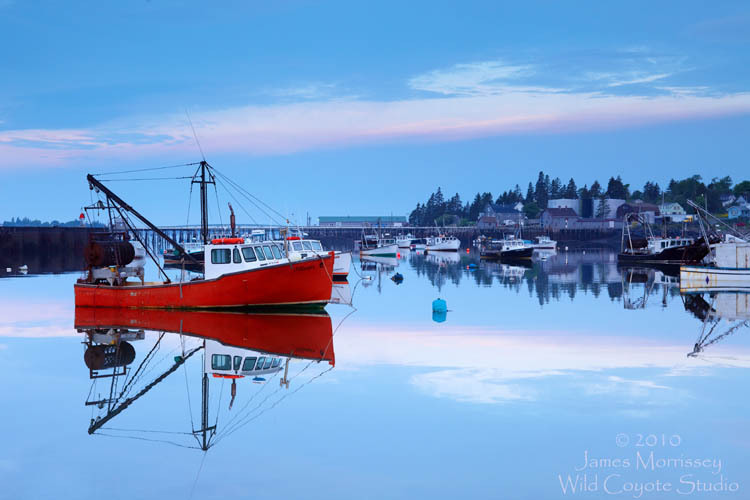 The boat from Jonesport (The Chief) typically leaves between 6:30 and 7 AM to Machias Seal Island. As we had never been to this part of Maine before, we chose to camp close to the boat. Even though there are clear instructions on the website about how to get to the dock, I am glad that we drove up the night before to scout the area. We easily could have gotten lost coming in from Bar Harbor at 4:30 AM. The campground that we stayed at is a small city owned campground that costs $12 bucks a night. There is no shower, but there at least is potable water and a Port-a-potty. The view of the marina was beautiful, and the folks inhabiting the campground seemed very down to earth. The following shot, taken at sunrise, was probably my favorite of the trip to Maine. We broke down the tent and arrived about an hour before the boat was to depart for the island. We had read on the website that there was sometimes some variability in when the boat left and opted to be there earlier rather than later. This day, the boat did not actually leave until about 7:30 AM, but I am told that this was the exception to the rule as it was the first boat of the season and there was some minor maintenance to be performed. I took the ride out later in the week and it left at about 7 AM. The boat ride to Machias Seal Island was not an eventless one. The sea was rocky that day (hey, that sounds like it could be in a book), and a few of the people on board got sea sick. If you are the sort who gets sea sick, I suggest you take a Dramamine (or equivalent) before getting onto the boat. The boat ride is fairly 'no frills' in terms of accommodations, but it makes up for everything in scenery. As I am not the sort who gets sea sick, I enjoyed the ride, seeing several marine mammals (like harbor seals and we believe that we saw a whale fluke for about a second) and birds. When we arrived on the island, it was approximately 10 AM. I was a bit surprised to see the "Welcome to Canada" sign that was prominently placed on the island, and the Canadian Wildlife Service individuals who work on the island. The island is 'in dispute' between the US and Canada, so I guess I was not sure what really to expect. The island has a functioning lighthouse that is operated by people. This is rare as I understand that most of the lighthouses in the area are automated. In Maine, at this time of the year, the sun had already been up for about 5 hours. Fortunately, there was a solid cloud cover providing overcast light with few shadows. Unfortunately, there was another boat of people ahead of us (from Cutler) in the blinds already that had just arrived. So, we ate our lunches (Holly, the owner, encouraged us to pack our own) and used the outhouse on the island. We wound up in the blinds viewing the birds probably at close to 11 AM. The blinds are gray simple boxes - about 3 feet deep, by 6 feet wide and about 7 feet high. I wish that I had photographed them. It looks a bit like you are about to go into solitary confinement - except that you have three other people crammed in with you. It makes it hard to use a tripod, but with a little bit of work, we all seemed to make out well enough. They ask that no more than 4 windows be open at any given time in the box, and that camera lenses not protrude through the windows. You get between 40 minutes and an hour in the box depending on weather. There is not much else to say, really. 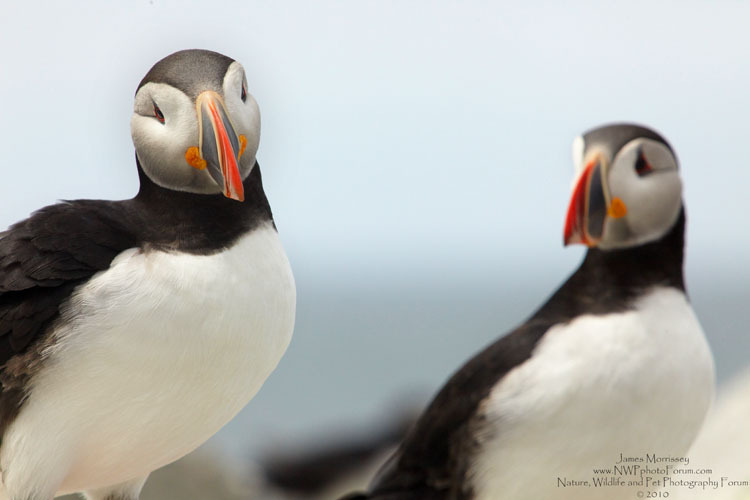 It is an extraodinary experience seeing the puffins. 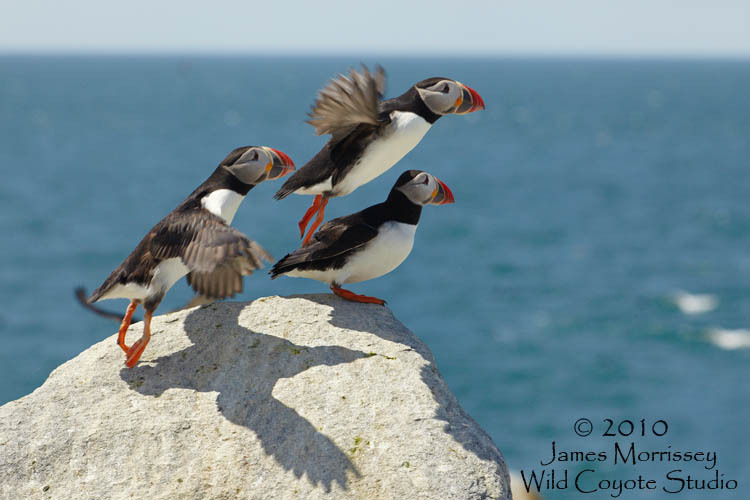 Chanthee and I are considering going up again in early July when the pufflings are hatched. There should be large numbers of puffins flying in with fish to feed the babies. By mid-August each year, the birds leave to continue their migratory route. An important note in this story is that should you go see the puffins, DO NOT expect to have amazing, warm light. The best light you can hope for is overcast light - "Nature's Softbox," as it has been said. On both occasions I got some overcast light and some direct light. You get what you get. However, you are pretty much guaranteed to see some beautiful birds doing what they do best - at very close distances. Just as importantly, the blinds provide the opportunity to do this in a way that provides only minimal discomfort to the birds. On my second trip to the island, I stayed in the blinds near the light house. 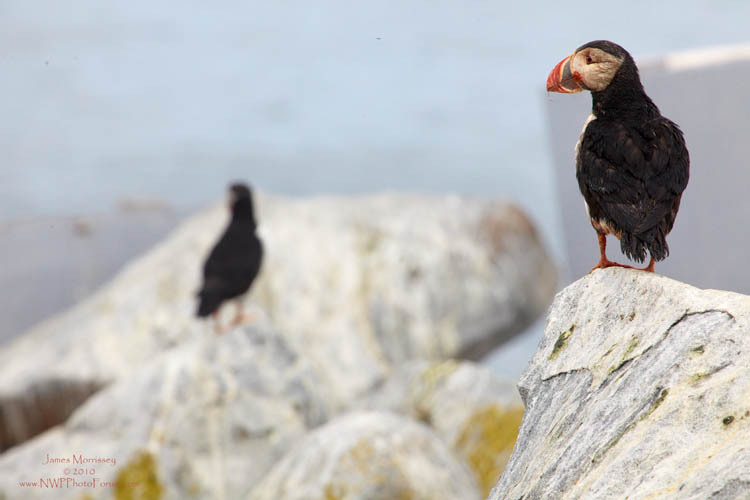 Sadly, I saw far fewer birds in total, and many less puffins. I am told that it really varies by day. "Some days the candy bar, some days the wrapper," as my friend Steve is want to say. 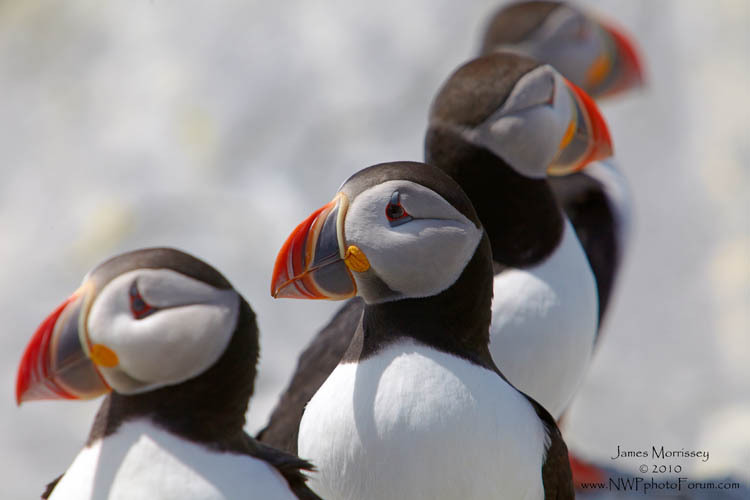 While I did not see as many puffins that day, they were certainly abundant enough. I also had the opportunity to study a few specific birds. This one puffin seemed like he had been attacked - my guess is by a seal. I had the opportunity to take several photos of him. As you can see, he was covered in blood. Nature is sometimes cruel. While I don't begrudge the seals a meal, I hope he makes it. I want to take a second and make a plug for the folks at Nortons of Jonesport. The trip is a bargain. For the $100 fee, you get about five hours on a boat with the great scenery and the landing on Machias. What more can you ask for?? I thoroughly enjoyed myself doing this - much more than I ever expected. Chanthee and I are planning on heading out again in Mid-July. This is an article that was lost in the server migration from earlier this year. Just a friendly reminder that the text and images shared within this article is copyrighted and the property of James Morrissey, Chanthee Keokhaw and The Nature, Wildlife and Pet Photography Forum. Neither the text nor photographic images may be re-distributed without explicit written permission. 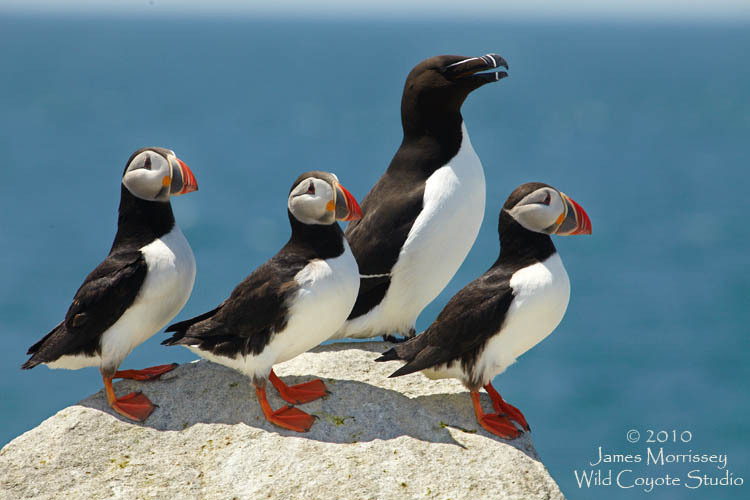 Please note that as of February 2011, Nortons of Jonesport is no longer providing puffin tours.